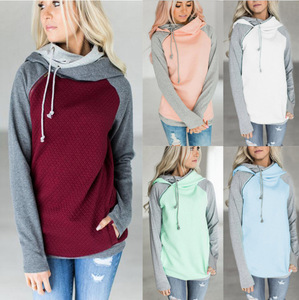 Description X88035A new style woman custom plain blank hoody women ladies crop fleece hoodies sweatshirts Model No. 1. OEM / ODM Service Moq: 300pcs each design ; Sample cost is additional 2. Wholesake items-in stocks Moq: 5/10pcs each design ; Sample price is double higher than wholesale price. 3. Labels / Hang Tags Service(make your brand logo labels/hang tags) Moq: 1000pcs each order ; Cost: 100-200usd each order We will do freely at your later orders. 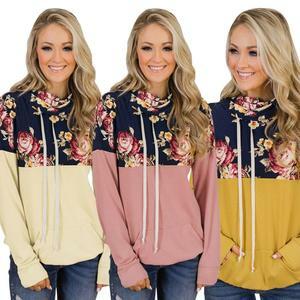 Many Colors Factory Price Floral Long Sleeves Autumn Casual Women Hooded Sweatshirt 1.Product Information Name Many Colors Factory Price Floral Long Sleeves Autumn Casual Women Hooded Sweatshirt Material 95%Polyester+5%Spandex Description Morning glory print body combine with grey color block in other part for a delicate look. The hood sweat with drawstring give a cool feel. Coordinating with a denim jeans for a casual look. ), can provide OEM and custom service and make various clothes based on the buyer's requirements and design. Please provide your detailed informations ,such as ,fabric ,color ,size ,qty and your logo design , then we will quote a price for you. If we are not by the side of computer , pls leave a message or send us an E-mail . 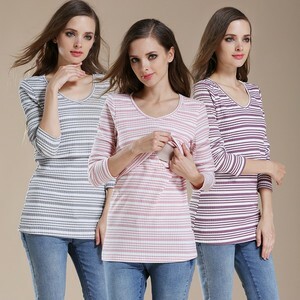 Alibaba.com offers 64,313 women sweatshirts products. About 63% of these are women's hoodies & sweatshirts, 2% are plus size shirts & blouses, and 1% are women's sweaters. 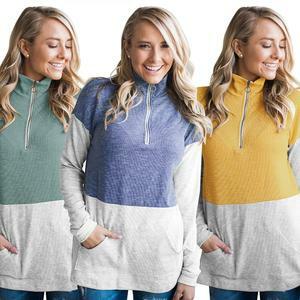 A wide variety of women sweatshirts options are available to you, such as 100% cotton, 100% polyester, and 100% bamboo fiber. You can also choose from in-stock items, oem service. As well as from beaded, garment dyed, and plain dyed. And whether women sweatshirts is free samples, or paid samples. There are 63,885 women sweatshirts suppliers, mainly located in Asia. The top supplying countries are China (Mainland), Pakistan, and Bangladesh, which supply 76%, 20%, and 1% of women sweatshirts respectively. Women sweatshirts products are most popular in North America, Western Europe, and South America. You can ensure product safety by selecting from certified suppliers, including 5,957 with Other, 1,510 with ISO9001, and 805 with BSCI certification.